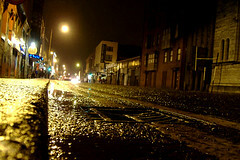 Car lights become abstract lasers of light along the main street of Cork City. In unrelated news, this morning I had to go to the hospital because something got stuck underneath the eyelid of my left eye yesterday. I could feel it there, my eye was weeping, it was sore and annoying. Thankfully I got to see a doctor after only a wait of an hour or two. He quickly removed the foreign material and sent me packing with a prescription for eye drops which I have to take for 5 days. Yes, I took a camera, and got a great snap of an older gentleman at the local shopping center which I must post tomorrow when I have time. Now to catch up on work.. I love the detail on the ground. Sharp. Amazing shot, I love the raindrops on the floor looking so still and giving a clam feel to the photo, while alongside are the blurred carlights, like lasers, giving a great contrast 🙂 a truly great image.